The full-sized Ford was advertised as “the carefree car” in 1961. The 1960 model year had not been a good one for passenger car sales at the Ford Motor Company of Canada, Limited. Only 30,687 new full-sized Fords had sold when the figures were tallied up. That figured into an 8.6 percent decline in the sale of North-American type automobiles from 1959. Fortunately, the overall picture for Canadian blue oval stockholders was salvaged somewhat by exports to wholly-owned subsidiaries in other Commonwealth countries, notably Ford of Australia, Ford of South Africa and Ford of New Zealand. In addition, there were significant increases in sales of captive imports and in domestic truck and tractor sales here at home. 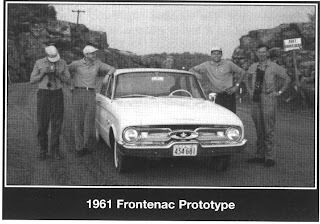 The main internal culprits responsible for the downturn in full-sized passenger car sales, surprisingly enough, were the new compact Ford cars, Falcon and Frontenac. Folks loved them and traded in their older--and much larger--Ford products for the smaller models, leaving the lovely full-sized Fords to gather dust on showroom floors. The smartly styled compact duo sold like hotcakes but didn’t inspire car owners to switch brands and bring in conquest sales like Rambler did. Astonishingly, sales of 17,152 compact Falcons, and 9,536 Frontenacs, along with 15,149 even smaller British Fords and 775 German Fords added up to a whopping 42,902 new owners, eclipsing domestic sales of full-sized Fords by nearly 12,000 units! There was no doubt in anyone’s mind in Oakville that the small car had taken deep root in with consumers and was not just a passing fancy. 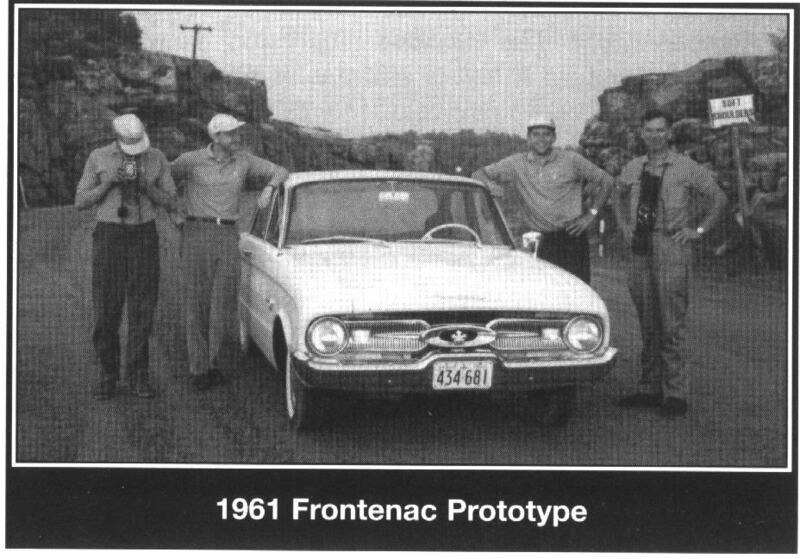 The Frontenac was replaced by the Mercury Comet. Despite the ever-increasing popularity of pint-sized automobiles, the full-sized passenger car was far from dead. Designers heavily reworked the full-sized Ford lineup for 1961. The grille was given a concave diamond pattern. It was divided by an oversized chrome light bar that ran horizontally across the centre to quad headlights, located at the outer edges of the fenders. The bumper wore a pronounced lip and wrapped around into the wheel well. A heavy crease ran from the heavily chromed headlight bezel to disappear neatly into the fender. Galaxie and Fairlane 500 models carried the appropriate model designation script between the leading edge of the wheelwell and the headlight chrome. Fords still had fins but they were tastefully trimmed and very sleek. The abbreviated flight appendages appeared in the last third of the front door and quietly whisked back to crown the Big Circle taillights. Ford’s Galaxie Club Victoria wore a formal, Thunderbird-inspired roofline. Rooflines on Galaxies were formal and made note of being Thunderbird like. The faddish Fifties wraparound windshield was gone. Advertising bragged, “No dogleg to knock your knees.” Lesser Fords carried a slim C-pillar, mated to a modestly wrapped rear window. More expensive models carried brightwork spears and aluminum inserts. This medal was presented by the Centro per L’Alta Moda Italiana for the 1961 Ford design. 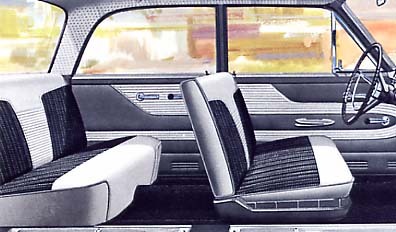 Interior of the swanky Galaxie Starliner used upscale materials. Consumers could choose among fourteen different award-winning models. The Galaxie Town Victoria was the four-door hardtop and one could be taken home for $2,845 plus taxes. 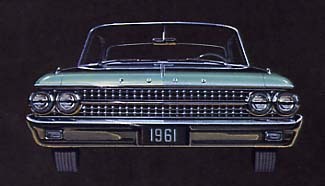 The Galaxie Club Victoria was the two-door hardtop. 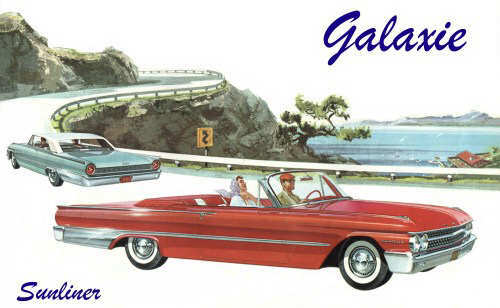 There was a Galaxie four-door Town Sedan and for $3,055, a Sunliner convertible. It is interesting to note that for the first time in years, the words “Tudor” and “Fordor” were not used in advertising. Interior of the modest Fairlane was attractive and colour-keyed to a choice of sixteen Diamond-Lustre exterior finishes. Owners of these swank top-of-the-line beauties were swaddled in “Galaxie luxury” replete with sofa-soft seats tailored in deep-pleated nylon fabrics, trimmed with leather-like vinyls and kissed with colour-keyed, deep-pile, nylon carpeting. There were plenty of goodies included as standard equipment that were optional cost extras on lesser Fords. From its double-paneled hood, double-hat roof supports to its vacation-volume trunk, here is the “Finer Inner Ford”. A pair of Fairlane 500s consisted of a four-door Town Sedan and a Two-door Club Sedan. The former listed for $2,580 and the latter for $2,522. 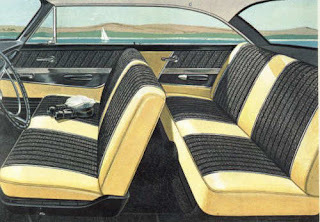 Four vinyl and nylon cloth upholstery combinations were available, all of them colour-keyed to sixteen exterior colours. Floors were finished in Vinyl-Tex rubber matting. The Fairlane Club Sedan was the least expensive Ford in 1961, listing for $2,522 before freight and taxes. The base Fairlane series offered the same two models, only in even more modest trim. The four-door sedan’s starting price was $2,450 and the two-door started at $2,392. 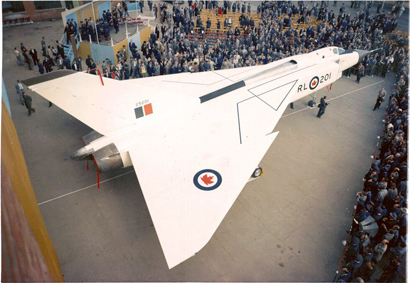 Three vinyl and nylon cloth upholstery combinations were mated to sixteen exterior colours. Underfoot was the Sof-Tred Carpet-Textured Rubber Floor, available in black only. Rounding out the line was half a dozen station wagons. 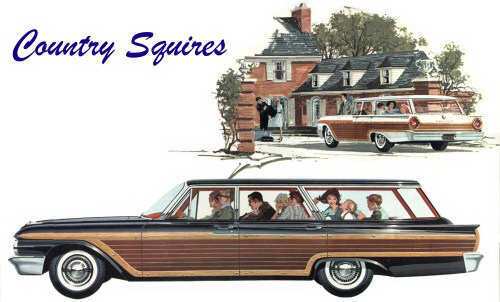 At the top of the line was a pair of imported--from the USA--posh Country Squire station wagons with seating for six or nine passengers. They were the most expensive full-sized Fords of all, costing $3,357 and $2,437 respectively. A pair of less well appointed, domestically built six or nine-passenger Country Sedans listed for $$2,951 and $3,066. Attention was drawn to the fact that the electrically powered tailgate was standard equipment. Finally there were the basic two- or four-door Ranch wagons selling for $2,769 and $2,744. 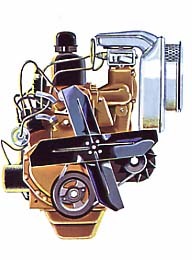 Standard engine for the full-sized Fords in 1961 was the 135-horsepower Mileage Maker Six, promising 24 miles to the Imperial gallon. Engine choices started with the 3.6-litre (135-horsepower) Mileage Maker Six, which was standard on all of the full-sized Fords. One could upgrade to the 5.4-litre (205-horsepower) Thunderbird 332 Special V-8 or the mighty 6.6-litre (300-horsepower) 390 V-8. All three promised exceptional mileage with regular gasoline, too. 1961 Ford instrument panel was elegantly executed. The stylish Fords offered basic value but dressing one up with optional equipment was fun. Cruise-O-Matic or Fordomatic transmissions, backup lights, the Console Range Radio, and an electric clock were all popular add-on items. At the end of the model year, executives in Oakville could breath a little easier. 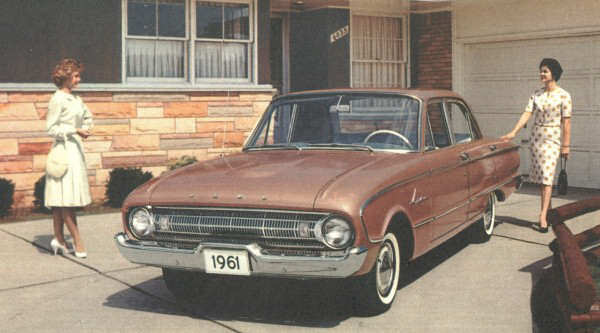 Sales of the full-sized Ford had held its own place in the domestic market. In fact, sales were up every so slightly to 30,791, an increase of 104 units.